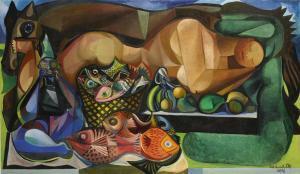 Find artworks, auction results, sale prices and pictures of Emiliano Di Cavalcanti at auctions worldwide. 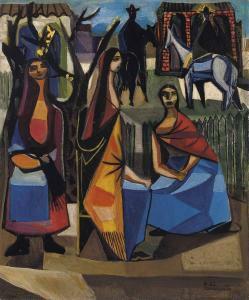 PROPERTY FROM A PRIVATE FRENCH COLLECTION Emiliano Di Cavalcanti (1897-1976) Untitled signed, dated, and dedicated 'E. 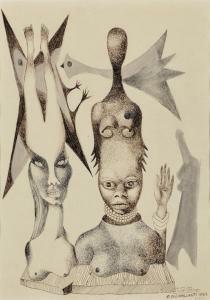 DI CAVALCANTI 1962/ A mon ami/ Jacques Petit Jean/ avec ma gratitude/ Paris' (lower right) watercolor and ink on paper 14½ x 10¾ in. 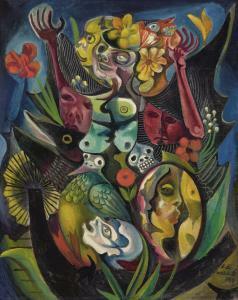 (36.9 x 27.3 cm.) Executed in 1962. Provenance The Jacques Petit Jean collection (acquired from the artist). By descent from the above. with Galerie Odile Oms, Céret, France. Acquired from the above by the present owner. Please note this lot is the property of a private individual. Plate/Sheet 18.7" x 25.8" — 47.5 x 65.5 cm. ; 20.5" x 27.2" — 52 x 69 cm. century that spread to South America. 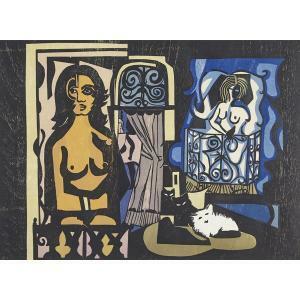 This print offers a true slice of Picasso, an homage to Cubism in a most dazzling form.